San Diego’s soulful songstress Andra Day is riding a wave of publicity this year resulting from several high profile projects. Her remake of “Mississippi Goddam” is featured in the acclaimed documentary What Happened, Miss Simone?, her single “Rise Up” is the soundtrack for the inspirational Serena Williams’ Beats By Dre commercial “Rise,” and her performance at the Sundance Festival caught the attention of Spike Lee, who agreed to direct the video for her the first single, “Forever Mine.” So it’s no surprise that by the time her major label debut, Cheers to the Fall, dropped last month, the press was already proclaiming Andra Day as the next (take your pick) Amy Winehouse, Eartha Kitt, Etta James, or Billy Holiday. She certainly possesses a distinctive retro fashion style and voice, but does her album live up to the hype? Following is “Only Love,” an obvious nod to a Goldfinger–era James Bond theme song featuring The Roots’ James Poyser (production) and Questlove on drums, Pino Palladino on bass, and scratching from DJ Jazzy Jeff—with the Dap-Kings injecting a Latin flavor and the Wired Strings a cinematic quality. Day switches to a more radio-ready style for the midtempo “Gold,” as well as the Adele-inspired tracks “Rearview” and “Red Flags.” Saadiq picks up the guitar and bass on “Mistakes,” with Charles Jones providing the organ riffs and Wired Strings filling out the harmonies. “Honey or Fire,” again backed by Saadiq and Jones, enters hard rock ballad territory on the chorus, where Day has no difficulty swapping her sultry vocals for a more strident sound. But the meat and potatoes of this album is retro soul, which returns in spades with the seductive ballad “Not Today.” Featuring a string-heavy chorus built on Motown-era girl group harmonies, this stand-out track is a cross between Etta James and Martha Reeves. The album closes with several fan favorites: the ballad “Gin & Juice (Let Go My Hand)” which slithers right up the spine, the hit single “Rise Up,” and finally the title track. 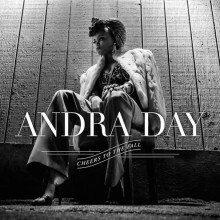 Saving one of the best for last, “Cheers to the Fall” is a more contemporary R&B/pop song, once again featuring Saadiq, Jones and the Wired Strings, with Day stretching her vocal range and losing some of her affectations. Like many singers with a very distinctive voice, Day must be careful to provide enough variety or the novelty will begin to wear thin by the fourth or fifth track. Day pulls this off with aplomb, creating an album of original songs that will appeal to a multi-generational audience while also showcasing her vocal dexterity and roots in jazz, soul and pop. This entry was posted in Rhythm & Blues, Soul, Funk and tagged Andra Day, Cheers to the Fall by aaamc. Bookmark the permalink.